Balik Kampung is a malay term for returning back to your village/hometown. So since Doraemon is from Japan, it's his kampung. But seriously I think he's made in China so ......what justification is this? And as alwiz, every trip there's the selection process, which hobbits to bring and which one to be left behind. It ain't easy. Hobbits keeping chill, enjoying the view from the top floor. Monkey was feeling generous and upgraded everyone into the very few themed 1,000 sqf suite, it's almost like a condo. Chip and Dale are the new additions to the family. The justification was, they were purchased from Disney SeaWorld Tokyo, so they are "Japanese" so in the future any Japan trips will include the two of then too. From the mountain range and the Japanese Alps we headed to the hot spring town and checked into a ryokan. Every trip to Japan, we insisted that we must stay in a ryokan. This time we stayed at the beautiful Beniya Mukayu with its beautiful view and bamboo flooring. Doraemon said this is his kinda home. While Monkey had to ensure that JS doesn't destroy any of the delicate flooring or doors with paper called Shoji. He's just too......rough with the sliding doors and delicate furnitures like this. From the West Coast of Japan, we headed to the ancient capital of Japan - Kyoto. One of our favourite city for its tradition and architecture. The Hobbits had a wonderful time again bcoz there's a miniature bonsai tree in our room with a stunning view. Funny thing is, every accommodations we stayed in, there's alwiz turned down service for the hobbits too. This shows even my hobbits were treated as a valuable guests at their property. 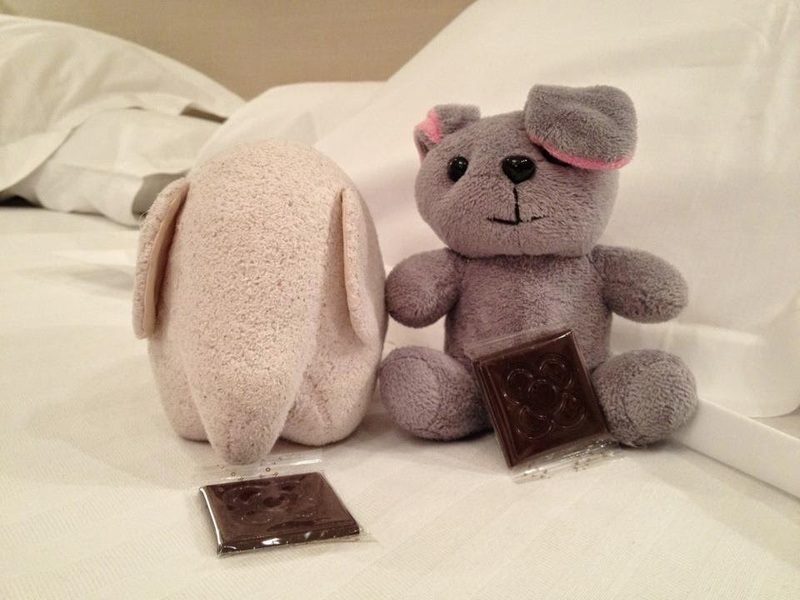 but one of the best turn down service was at a hotel in Barcelona....hahaha my hobbits then a family of two got their fair share of chocolates. Most of the time, the chamber maids will just snuggle my hobbits under the thick duvet or placed them in circular arrangement as though they are having their AGM. Yes annual general meeting of who should travel again and who should just stay at home!! !